The “Monarch Freeplay Pool Table” is a classic British slate bed pool table is a great value addition to any home games room. The Monarch slate bed pool table benefits from an extremely sturdy design and sleek looks creating a perfect centre piece. 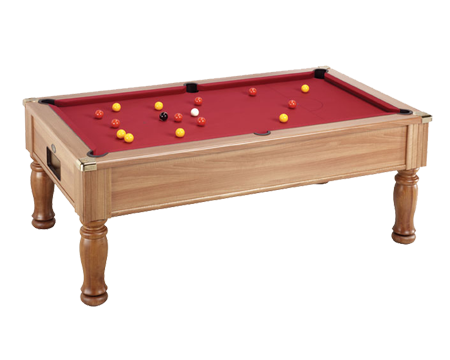 The “Monarch Freeplay Slate Bed Pool Table” has polished chrome corners fitted with quick drop pockets and life long pocket liners inserts. The Monarch is unique for a Freeplay pool table in that it is also fitted with a cue ball separator which you would normally only find on a coin operated pool table so the cue ball return to the “D” end when potted.